Field tests in the Ílhavo Municipal Swimming-Pool on transfer between grid connected and islanding modes Results: Field tests demonstrated the feasibility. 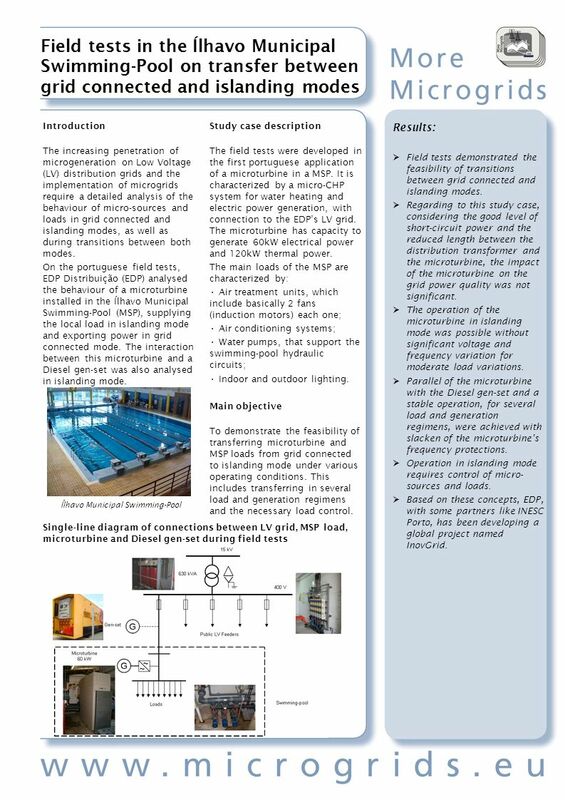 Download ppt "Field tests in the Ílhavo Municipal Swimming-Pool on transfer between grid connected and islanding modes Results: Field tests demonstrated the feasibility." 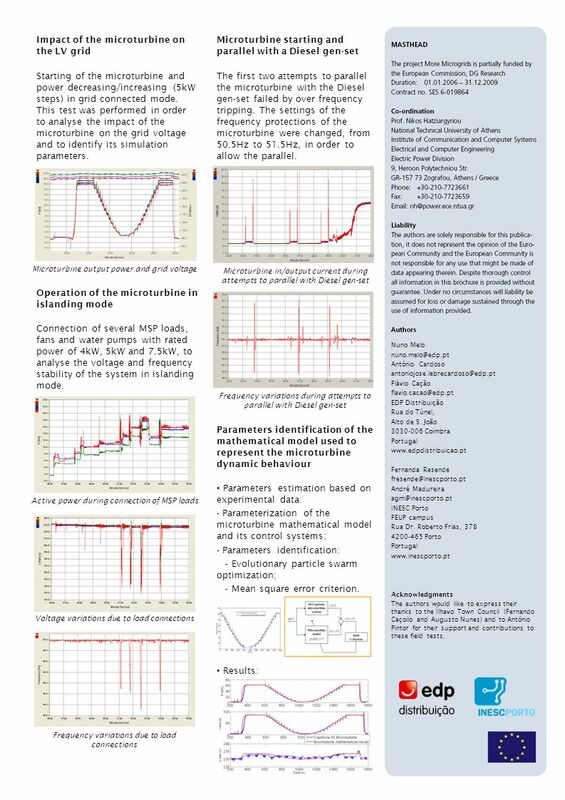 Frankfurt (Germany), 6-9 June 2011 Paper-ID: 0273 Power quality aspects of rural grids with high penetration of microgeneration, mainly PV installations. University of Minho School of Engineering Territory, Environment and Construction Centre (C-TAC) Uma Escola a Reinventar o Futuro – Semana da Escola de. From Knowledge Generation To Science-based Innovation Broadband Maritime Communications The Mare-Fi Project Rui Campos, Mário Lopes, Luciano Santos, Filipe. Understanding Electrical TransmissionDemonstration D1 A Guide to the National Grid Transmission Model Demonstration D1 Power losses in transmission. DOD Microgrids The Missing Link: Microgrid Applications Michael Dempsey P.E. Burns & McDonnell June 12, 2013 © 2013 Burns & McDonnell. All Rights Reserved. Leonardo da Vinci ALLEGRO © J. M. Martins Ferreira - University of Porto (FEUP / DEEC)1 Non-BS cluster testing by PRPG / SA J. M. Martins Ferreira FEUP. DYNAMIC LOAD RESPONSE: As a result of the impressed inverter output wave form. Presenter: Dr Gawie van der Merwe. Unit 2 Activities 1 and 2 Mr. Singer Physical Science. Power Electronics in New and Renewable Energy Systems Mohammad A. Abusara Lecturer in control and Power Electronics Renewable Energy Research Group College. Campus da FEUP Rua Dr. Roberto Frias, Porto Portugal T F © 2009 Decentralised Energy Systems. The Scaling of Machines for Renewable Energy Applications Ramzi Solomon Energy Postgraduate Conference 2013.